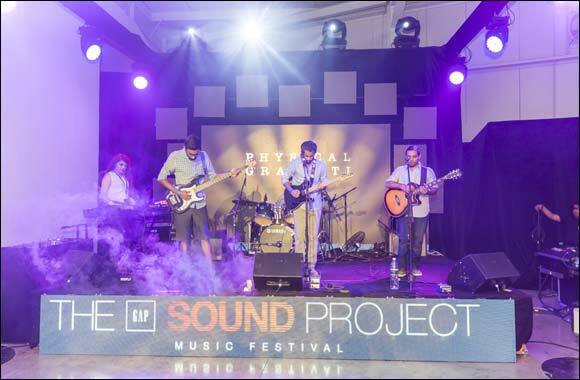 Gap enthusiasts and music lovers recently flocked to Art Sawa gallery in Al Quoz to witness region’s hand-picked artists perform an electric fusion of inspiring music that kept the audience enthralled for hours. From Gap festival wristbands to sun chairs, bean bags and food stalls, there was fun and entertainment packed for everyone. The festival was hosted to celebrate Gap’s recent partnership with TripleW.me to support emerging talent and the burgeoning music scene in the Gulf. The music festival saw the Gap Recording Room contest winner, Craig Perry and the runner-up band, Physical Graffiti; perform with two other bands that included the renowned Hollaphonic featuring Greg Stainer and Olly Wood and Behold the Locus with lead artist Fabian Martin. From over 100 brands from UAE, Qatar, Kuwait, Bahrain and Oman that registered to be part of the Gap Recording Room competition and after reviewing weeks of online voting, top five bands performed for the judging panel that comprised of music industry veterans, Gap experts and the TripleW.me team. Craig Perry was announced as the final winner among the five bands shortlisted, which included Mr.Fari from Kuwait, Tarek Sidani from Qatar, The Relocators from Bahrain and Physical Graffiti from the UAE. Craig Perry walked away with a lifetime opportunity of getting a professionally produced album at an all-expense paid trip to Grouse Lodge Residential studios, in Ireland. In 1820, Grouse Lodge was built, around the same time denim was invented, and it’s here, in 2014, thanks to Gap, that The Craig Perry band record their future. Back at the festival, whether you were the traditional pin ball participant or a blooming millennial who enjoyed spending time at the Seflie Mirror, The Gap Music Festival had something for every Gap generation- just like the Gap store. Gap embraces individuality and is a brand that is spirited with youthful energy. It is the slight twist, that little detail that makes it fun - that makes it Gap. TripleW.me is a Pan Arab online content platform that allows people from around the region to share and enjoy music, film and photography. The first site of its kind in the region, TripleW.me provides an innovative, regional alternative to the mainstream mass-market scene. Founded by Paul Kelly and partners in Dubai in 2010, the company was born out of a desire to showcase the Middle East's creativity to the world. TripleW.me provides talented individuals in the Middle East with a dedicated platform to create and promote their own content. Members can share their opinions and engage constructively with like-minded individuals, providing the forum for a regional perspective on home-grown talent and international trends.